Luscious pancakes filled with honey flavoured blueberries in a cassis or cognac liquor. Blueberries taste divine and are packed with vitamins and minerals. These scrumptious crepes will bring a sparkle to the eyes of your love. First make the pancakes. Place flour and salt in a bowl and beat in egg. Gradually add milk and beat more to give a smooth, thin batter - it should be the consistency of single cream. Melt a little butter in a pan and add a scant ladleful of batter. Swirl around to coat the bottom of the pan thinly. Cook over medium heat until the underside is beginning to brown. Flip over and cook other side. Repeat with remaining butter and batter. Cool pancakes. Fold pancakes in half, then in half again to give a triangular pocket. Heat another 25g/1oz butter in a pancake pan and add 25g/1oz sugar. Bubble to dissolve sugar and make a syrup. Place two folded pancakes at a time into the syrup. Spoon half blueberries into the pockets of the pancakes. Spoon buttery mix over and heat through. Add half honey and just melt - do this at the last minute as honey can scorch. 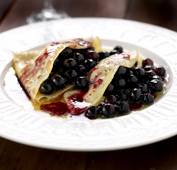 Repeat with remaining ingredients, pancakes and blueberries Serve immediately finished with a splash of cassis or cognac.